On Monday 22nd April 2019 the sun will rise at 05:54 and will set at 20:28. It will be a mild day, with temperatures reaching around 19.6°C. Today is expected to be a dry day, with a very low chance of rain. It will be quite a breezy day, with a maximum expected wind speed of 19mph. On Tuesday 23rd April 2019 the sun will rise at 05:52 and will set at 20:29. It will be a mild day, with temperatures reaching around 18.6°C. Today is expected to be a dry day, with a very low chance of rain. It will be quite a breezy day, with a maximum expected wind speed of 18mph. On Wednesday 24th April 2019 the sun will rise at 05:50 and will set at 20:31. It will be a mild day, with temperatures reaching around 14.2°C. Heavy rain which could cause some standing water is expected, 13mm of rainfall is possible today. There could be quite a strong breeze in the air today, with a maximum expected wind speed of 20mph. On Thursday 25th April 2019 the sun will rise at 05:48 and will set at 20:33. It will be a mild day, with temperatures reaching around 12.8°C. A few showers are expected, 3mm of rainfall is possible today. It could be quite a gusty day today, with a maximum expected wind speed of 31mph. On Friday 26th April 2019 the sun will rise at 05:45 and will set at 20:35. It will be a mild day, with temperatures reaching around 9.8°C. Some moderate to heavy rain is expected, 6mm of rainfall is possible today. Some quite strong winds are possible today, with a maximum expected wind speed of 36mph. On Saturday 27th April 2019 the sun will rise at 05:43 and will set at 20:37. It will be a mild day, with temperatures reaching around 9°C. Heavy rain which could cause some standing water is expected, 12mm of rainfall is possible today. Moderate Gales are possible. Please watch out for local weather warnings, with a maximum expected wind speed of 48mph. On Sunday 28th April 2019 the sun will rise at 05:41 and will set at 20:39. It will be a mild day, with temperatures reaching around 4.7°C. Today is expected to be a dry day, with a very low chance of rain. It will be quite a breezy day, with a maximum expected wind speed of 17mph. 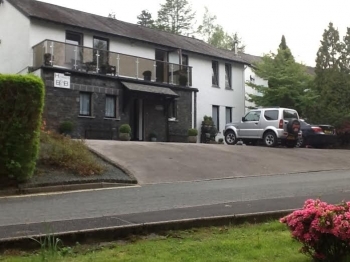 The Howes is situated close to the famous Stockghyll Waterfalls but only a 3 min walk into Ambleside. You can leave your car securely and walk from the front door, Wansfell is only a 10 minute walk away. We have 3 en-suite rooms on the ground floor and we also accommodate well behaved dogs by arrangement. We like to serve breakfast in your own room- yes a full English breakfast and room service at no extra cost. We have a superb garden which is terraced and on fine mornings we serve breakfast on the terrace while you can observe the wonderful mountains, Fairfield Horseshoe, Loughrigg and Wansfell. Also an ideal place to enjoy a nice cool beer after a long day out! !